I was shocked when I strolled and scrolled my ultimate shopping site LuisaViaRoma this morning. I received an e-mail about their latest program (sometimes there's cool update and just-in or exclusive items, so you better subscribe for their newsletter), and this time was titled WHAT'S HOT- NEW WINTER GRAB BAG. There are LOTS of interesting masterpiece like Alexander McQueen knucklebox clutch series. They never stop shocking us (in a good way), do they? After look-a-like Hell's Angel skull, now they create what look like a fresh flower bouquet from French garden and 'angels phyton' which is two cupids hanging on a skull-frower chain. Or Giorgio Armani Swarovski embroidered silk satin clutch. Or Olimpia Le-Tan schoolbook clutch, which will make you look carrying a book (genius!) instead of a bag. But also, there is this Vlieger&Vandam bag. They call it "Guardian Angel Embossed Leather Clutch". What emboss? A GUN. 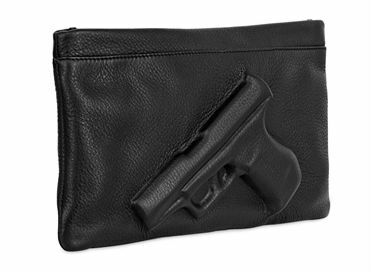 I don't know what they're thinking when they designed this, but for me, while many people are still in quandary and nasty debating about gun control, I don't think it's a good idea to get a real-size gun embossed on your clutch. 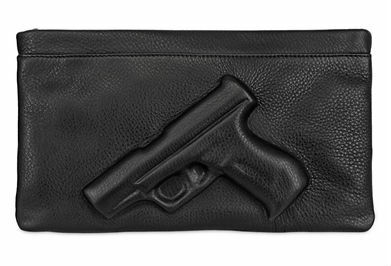 I know it is just an emboss, but at a glance, it looks like you glue your gun onto your clutch. But I can't avoid admitting that it is a brilliant (yet scary) idea. I wonder if a hotel would allow you in for a fine dining when you carry this. Signorefandi, so lemme get it straight. You mean your guardian angel is a gun?